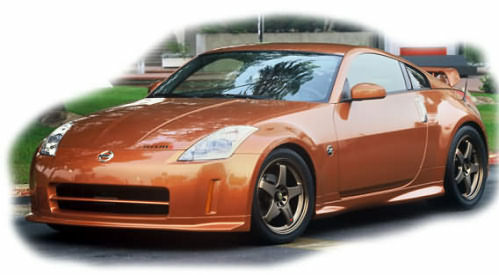 The classic Nissan Z car got a burst of life with the 2003 introduction of the 3.5 litre V6 350z. With the NISMO (Nissan Motorsport) models looking particularly slick indeed. The chassis is superb, and instantly became a favourite on the D1GP circuit. With twin turbo and supercharged models appearing from the get go, there is plenty of power to be had over the stock 287bhp, and to improve the stock 0-60 of 5.9s. Like the Silvia, the other great Nissan drift car, the 350z looks set to become the standard drift car in years to come. Easily one of the best looking cars on the road today. Japanese, import models come in several thousand pounds cheaper than UK models, and can be picked up for £12000 or so. However AVOID American imports, as their suspensions are wobbly and horrid. Conclusion, one of the best sounded, and looking drift cars you can buy. For cheap fun and good looks check out the 300zx. Twin Turbo 6 cylinder engine provides 300bhp and its VG30DETT engine is highly tunable thanks partly to the two intercoolers which can be replaced for much bigger units easily and bhp/£ fairly cheaply. 0-60 flys by in around 5.7s for the twin turbo models. In general avoid the convertible as it lacks finesse, and unlike the 350z roadster it doesn't look that great either. Despite this the T-Bar is fun, and the car has lots of aftermarket parts, as with most Nissan's, to add to the already high spec. Unfortunately due to emissions failure the car stopped UK production in 1994, however imports continue from Japan. Expect to pay £3000 for a good twin turbo Z32 example. Great car often overlooked.